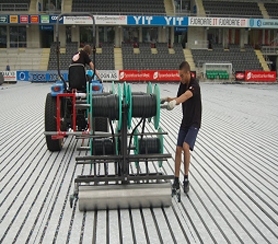 We are very pleased to announce that the installation of the AHT Outdoor Amorphous Metal Ribbon de-icing system has been successfully completed at Sogndal Football Club by the HSI team after 10 days of hard work. 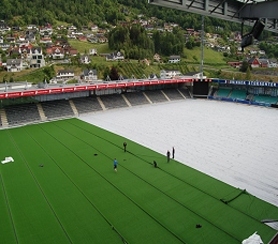 Sogndal FC which was founded in 1926 is a member of the Norwegian Premier League and its Fosshaugane Campus stadium has a capacity of 4,000. 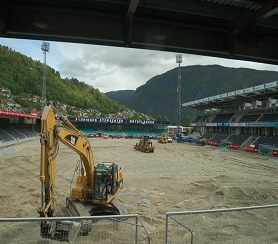 This is the 4th sports-field completed in Norway and the 5th is scheduled for August 2012. 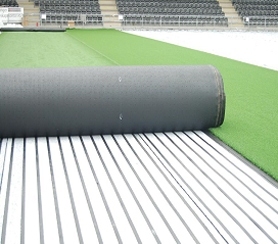 We would like to congratulate Mr Rene Smits and his HSI team for their excellent work which has made AHT already a leading force in the Norwegian as well as the International Sport-field heating market.